diese Seite ist derzeit nur in Englisch verfügbar. Behind the pulse compressor, the beam is guided towards the target chamber under vacuum. In or in front of the target chamber, several focusing options exist, based on off-axis parabolas with different focal distances and total deviation angles. 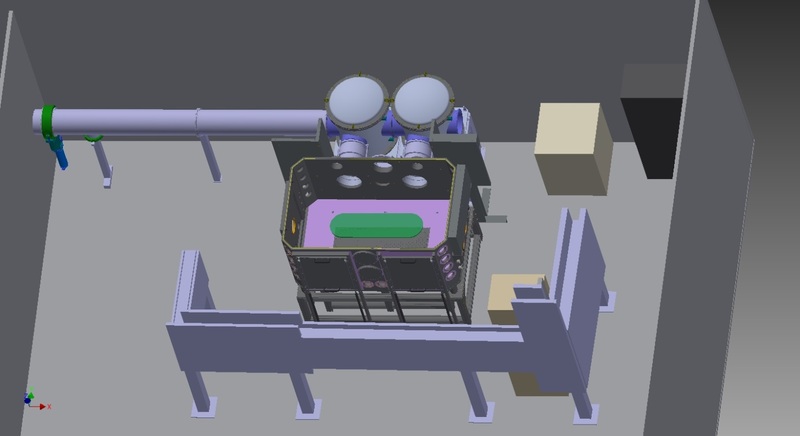 A view of the target area is shown below, in which the target chamber is depicted in dark grey and the turning boxes in light grey, as well as the area in which the target can be placed due to shielding constraints in green. Strong focusing using a 45°, f=400 mm off-axis parabola which can use a larger rectangular beam of 250 x 250 mm2 behind the compressor is available for high-intensity applications with a focal spot size of a few µm. The energy before compression is limited to 200 J in this case. Depending on the experimental requirements, the parabola can be installed in several different locations inside the target chamber, although this may limit the beam size and maximum energies when beam deviations of more than 45° are necessary. In the standard configuration, the beam arriving via TB2 is arriving directly on the parabola and thus focused to position TSN. The double-beam option can provide two 90 x 150 mm2 beams with a delay of 0-1000 ps and variable energy ratio (max 50 J/beam before compression), which can be focused independently (using two half-parabolas) within about 20 mm around TSN or TLN. In addition, the double-pulse option can be used to generate two co-propagating pulses with a delay of 0-1000 ps with the same pulse duration or 100-1000 ps with different pulse durations of 500 fs to 5 ps. The standard beam height above the target chamber breadboard is 360 mm. At this height, a number of side ports are available in the target chamber walls and doors for mounting diagnostics and equipment. Additional ports with different sizes (ISO-K 100, CF 100 to CF 200, KF 40) are available above and below the beam height, as well as in the ceiling of the target chamber which is 890 mm above the breadboard. Optical diagnostics setups can be arranged on external breadboards around the chamber, either at beam height or the internal breadboard height. All diagnostics which are to be installed inside the target chamber have to meet high-vacuum standards (1E-6 mbar) concerning cleanliness, outgassing of materials, lubrication, as well as venting of internal cavities. All material which is to be brought into the target area should be appropriate for a class 10.000 cleanroom, especially cardboard or wooden boxes are not allowed.